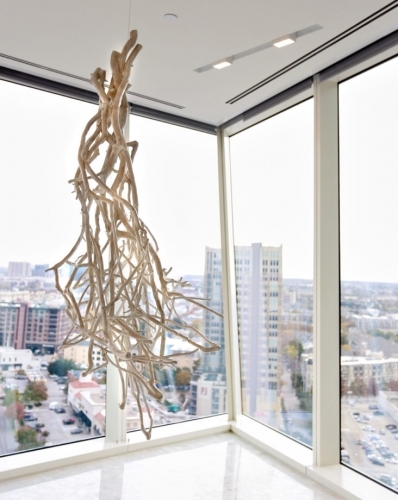 Dallas gallery owner Cris Worley commissioned pieces from local artists for Gardere’s Uptown digs to boost employee morale. All this is done to provide ease of comfort for the worker. From technology to layout to amenities, the workplace should make their actions more efficient. Staffers who work outside the office can continue to do so and have a desk for when they’re needed in-house. The collaborative open concept remains, but there are hideaways for private, head-down work. And, to cut down on hearing your neighbor, white noise is pumped in to drown out impertinent conversation. The coffee is fancier, the art is unique to the client, and the small touches that highlight the company itself are found in the architecture—subtle enhancements that highlight the brand without bludgeoning you with its name. Ideally, this creates a level of comfort that becomes an extension of the employee. Where you go to work starts to feel, almost subconsciously, like just another place in your day.